Certain food combinations are Louisiana’s seasonal essentials, like May’s first brown shrimp, creole tomatoes, and fresh corn (in corn soup), or fall’s roasted wild ducks and sweet potatoes. 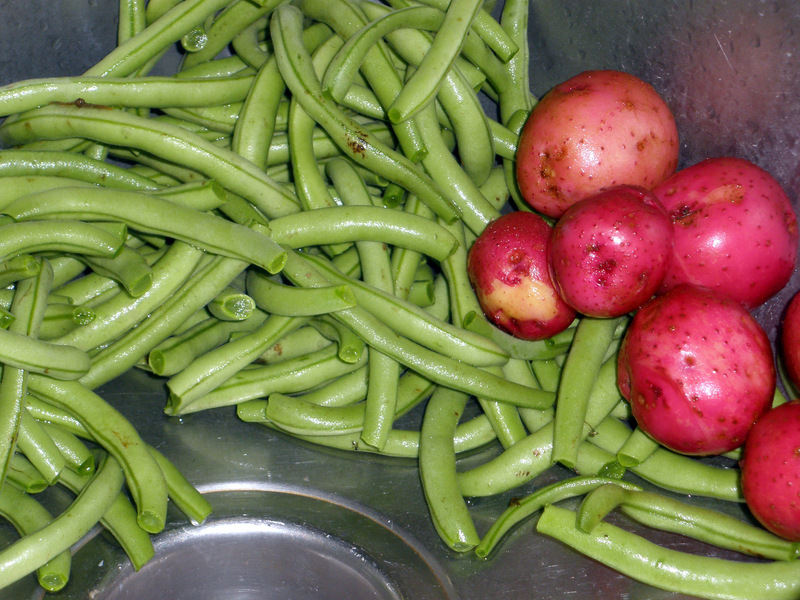 Right now, farmers’ markets and backyard gardens overflow with green beans and freshly dug potatoes–a natural, seasonal pairing across south Louisiana. It’s humble combination little known in more urban areas of the state, but rural folks of every stripe enjoy the combination. The dish turns up at church suppers, on plate lunches all over Acadiana, and it regularly appeared on public school cafeteria trays when I was a kid. Newly harvested potatoes have a lush, creamy texture, which provides a good foil for the snapping, slightly astringent beans. Of course, browned onions, garlic, and a generous amount of seasoned, smoked pork flavors the dish–I used peppery smoked sausage, resulting in a bean broth delicious enough to ladle over rice. 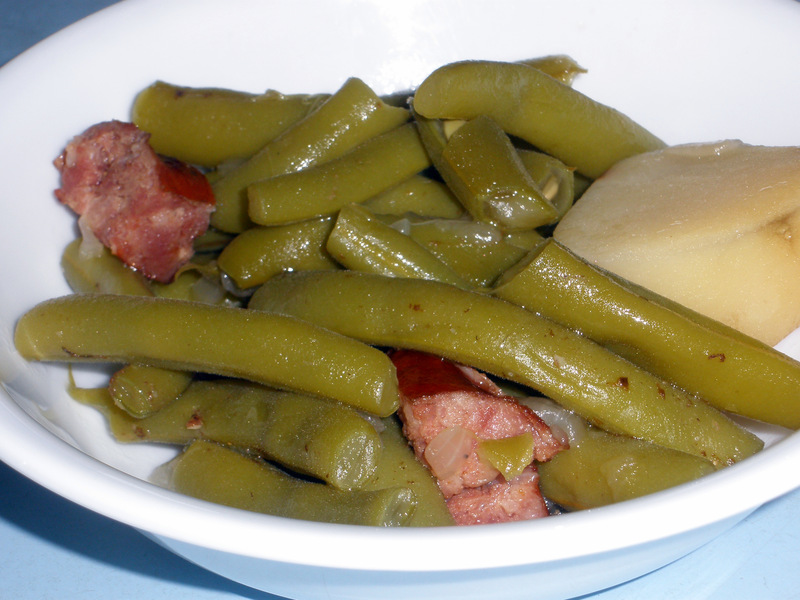 (Yes, in good Cajun fashion, many people serve this potato and bean dish over rice.) Some cooks “french” the beans, running each pot through a splitter, though I don’t have the patience to french more than a few snap beans. While this dish won’t make the cut for true vegetarians, pork-infused vegetable dishes are a good alternative to a protein-focused meal. Historically, slow-cooked, smoky-pork-infused vegetable dishes served as “meat-stretching” entrees. Small chunks of sausage ensure that every bite is rich and meaty, though only a small portion of seasoning meat is required to flavor the entire dish. The finished dish’s depth of seasoning depends largely on the seasoning meat’s quality and on the initial browning steps, so choose a sausage tasty enough to stand on its own, or use a heavily smoked tasso or ham. If plain ham is used, additional seasoning may be required. 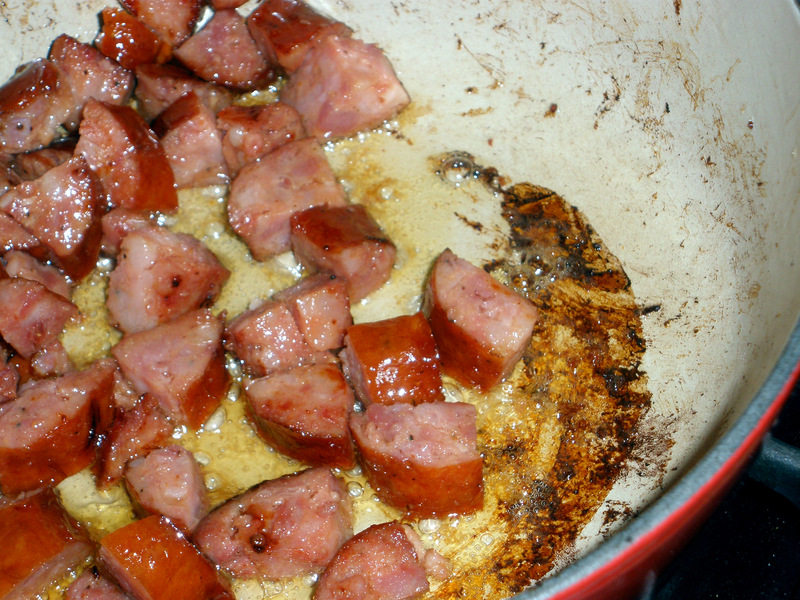 In a 5 quart or larger pot, heat oil and smoked sausage over medium heat, stirring frequently. Cook until sausage is well-browned; do not hurry through this step, as the caramelization is essential to the dish’s flavor and color. Add onions to the pot; allow the onions’ moisture to lift the caramelized bits off the pot’s bottom before stirring. Saute onions until nicely browned, then add garlic, cooking just until it is fragrant. 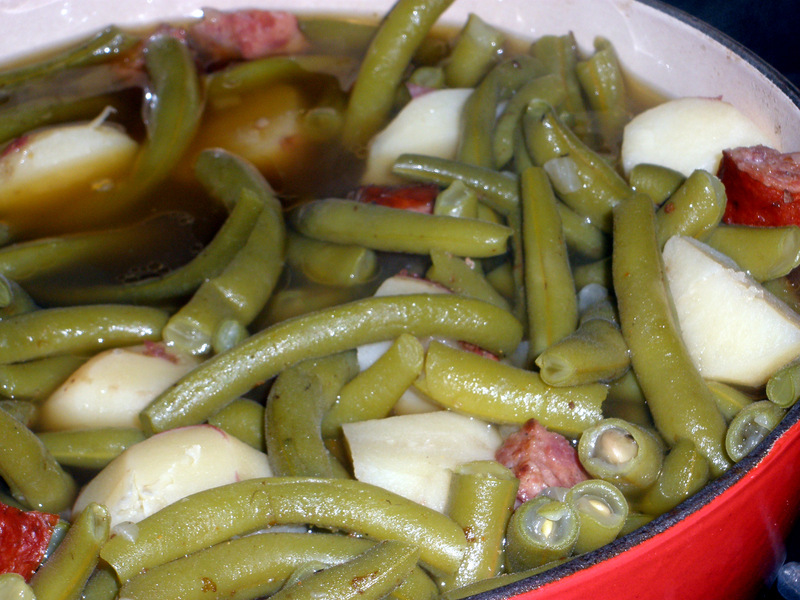 Add green beans, potatoes, and enough water to barely submerge the beans. Bring to a full boil, then reduce heat to a gentle boil. Cook at a steady simmer until potatoes and beans are tender (begin testing for doneness at 15 minutes). Taste, and adjust salt and pepper levels to suit. Do not salt until the dish is finished, as the sausage may provide sufficient salt on its own.